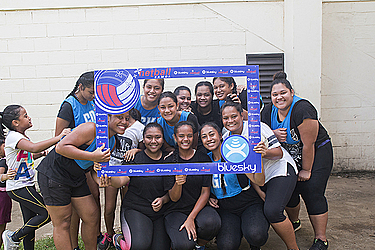 The Netball Samoa Oriana KidsNET development kicked off the second round of their tournament at the National University of Samoa Gymnasium during the weekend. Focusing on the next generation of Netballers is indeed the main objective and initiative behind this tournament. Netball Samoa Chief Executive Rosemarie Esera said the tournament has been a positive outing for the young generation of girls. She said she is overwhelmed with the support of parents, as well as the support of Churches who have formed Sunday school teams to take part. Leusoali’i Congregational Christian Church Coach Elalaumate Tunupopo is among them. The Vailele C.C.C.S. Sunday School Netball Coach Leleipeleise Sepulonu says the tournament is a way to stay healthy.